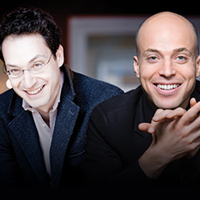 Performing as an Israeli-American piano duo, Shai Wosner and Orion Weiss are both recipients of the prestigious Avery Fisher Career Grant. Together they will present a program of two piano and duo piano works. This performance is no longer on sale online. To purchase tickets, please come to the box office, located in front of Gartner Auditorium at the Cleveland Museum of Art, starting at 7:00 pm on Saturday, March 2, 2019.